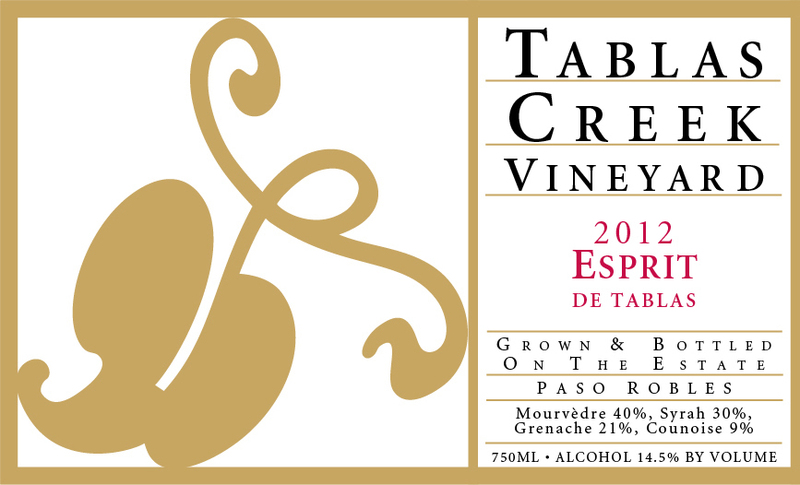 The Tablas Creek Vineyard 2012 Esprit de Tablas* is a blend of four estate-grown varietals, propagated from budwood cuttings from the Château de Beaucastel estate. The wine is based on the dark red fruit, earth, spice and mid-palate richness of Mourvèdre, with additions of Grenache for forward fruit, approachability and lushness, Syrah for mineral, aromatics, and back-palate tannins, and Counoise for brambly spice and acidity. The nose is winey and serious, with aromas of blackberry, mint chocolate, aged balsamic, Worcestershire and red licorice. The palate is long and complex, with flavors of black raspberry, plum compote and leather, and Mourvedre's signature flavors of cassis, black tea and roasted meat. The wine's tannins come out on the long finish. We recommend that you hold the 2012 Esprit for a few months, then drink either between 2015 and 2017 or 2020-2040. *Curious about the new name of our signature blends? Please read about this change on our blog post. The grapes for our Esprit de Tablas were grown on our 120-acre certified organic estate vineyard. The grapes were fermented using native yeasts in open and closed stainless steel fermenters. After pressing, the wines were moved into barrel, blended, and aged in 1200-gallon French oak foudres before being bottled in July 2014.